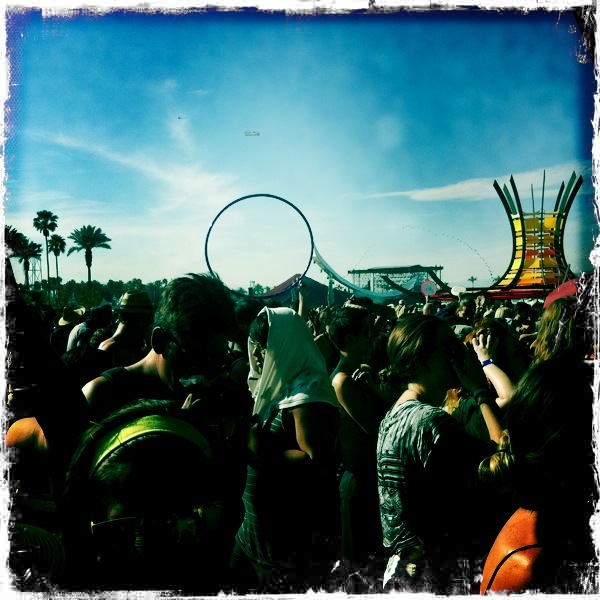 ::: Off the Radar :::: Oh Coachella! Oi! Sorry for my absence, but I just got back from a 5 week job hunt roller coaster ride in Los Angeles. I didn't plan on attending this year's Coachella, but I just happened to still be out there and was able to find a ticket, so of course I went! This year's Coachella was more laxed because I didn't have to stress for scrounging up a ticket everyday like last year, but nonetheless the music experiences are amongst the best ever! If you are up for reading last year's adventures its here, here, and here. There was a lot more organization this year then there has ever been. I will say a big thank you to AT&T for finally having more coverage and being able to send/receive texts and phone calls during the festival. What a difference! Throughout my four years of attending, I have never been so early everyday as this year, but it was solely because there were great acts scheduled to play early. Here are my highlights and a couple that I saw that weren't highlights like I had expected. Friday began with The Rural Alberta Advantage and what a way to start off the festival! I have blogged about them a couple of times and now I finally got to see them live. It's always great when you go to a huge festival like this because you get to see the people from all over the world who share the love for the band as you do. They played a nice mix of songs from their latest album, "Departing" and the first album, "Hometowns". Fort McFurry, the lead singer has a very distinctive voice, one that takes a few listens to synch in. To me his voice is a bit reminiscent of Jeff Mangum from Neutral Milk Hotel. These are the voices you either like or don't, and I definitely like it. About halfway during the show McFurry's voice was a bit shot and he mentioned that he was battling a cold. Either way was a great show and I am so glad I didn't miss it. !!! 's (chk chk chk) show was more of an electronic-rock dance party just like their albums sound like, but with the added live energy that you'd expect and hope for. The show was a great warm up for the rest of the day. I do think that they should have played at sunset or later in the night. It's crazy that the band has been around since the early 00's and they still only got an early afternoon slot. !!! has become more popular with their 2010 release, "Strange Weather Isn't It". They mostly played from this album although I was hoping to hear my favorite track of theirs, "Me and Guilliani Down by the School Yard" (2003), but you just can't hear it all! We went to Cold Cave for a few songs and their synth pop sound was just like that off the album, but I didn't feel that they brought that much extra energy to the stage. For The Morning Benders being a new band they had quite the crowd. The singer, writer and guitarist, Chris Chu had a very good stage presence and really made the show as good as it was. I do think though that there was something missing from the show, but I can't put my finger on it. We saw one of my all time favorites, Broken Social Scene next and as usual I was not disappointed. I have seen BSS the most, tallying up to 7 times and they always put on a really great show. This was the first time however, seeing them at Coachella and they played at sunset...recipe for a classic show. Their last release, "Forgiveness Rock Record", is not my favorite album of theirs, "You Forgot it in People" (2002) is and I was so happy to hear them play great ones from that album. Empire of the Sun was definitely on my top list to see since I had played their album over and over in 2009. The show was a very theatrical and entertaining with crazy costumes and visuals, and I would have to give them an A for that. My special someone whom I was with who is very knowledgeable in music did recognize that the band wasn't performing everything live, especially the drums. If you are going to bring out the instruments then play them! Ohhhh Arcade Fire! They rocked it! Second time seeing them and both on the main stage at Coachella. The bands live performances have a mixture of many instruments, energy, and visuals, and they definitely know how to put them all together for an all out stellar show. During "Wake Up", the last song, they dropped hundreds of LED balloons on the crowd. I would rather not use this word but it's the only one that fits...EPIC! If you every get the chance to see them, they are a must and are definitely making music history. The last show of the night was Cut Copy and it was an amazing way to end the night. It was a huge dance party where nobody was left out. It's a bit of a Coachella blur but I know I didn't stop singing and dancing until they were finished. Ahhhhh what a day! Menomena, whom I have wanted to see since their first release, "I Am the Fun Blame Monster" (2003). They were a perfect way to start the day and I knew that within the first song it was going to be a quality show. We were able to get up very close because it was early in the day, and didn't have to finagle through the sweaty crowds. Each band member played at least two instruments and very well, they are a super talented band. Being a new big fan (last year) of the Foals, I was very excited to see them. They were musically amazing, and the energy level of the band and the crowd were great. It was one of the best shows at Coachella this year. CSS and I have to say that it wasn't as good as I hoped for, actually it was rather cheesy and didn't sound up to par. We left after a few songs to get some yummy cocktails instead! The National made my top Coachella list this year, #1 or #2 with Arcade Fire. I have only seen them once last year in New Jersey at the Wellmont Theatre. We were standing in the very last row and at the very top that they looked like miniature people with instruments. This time, I was going to get pretty close. Just like Arcade Fire and Broken Social Scene, lots of great musicians on one stage who really know how to put everything together in a flawless way. Another band that I believe are making music history with their live performances. If you have a list of things you have to do in your lifetime, Coachella should be somewhere on that list...without a doubt! As many videos as I took, I was dancing and shaking the camera too much so I had to venture on youtube for some better videos. I didn't want OTR readers to get dizzy! ha Some of the audio on these aren't that great so watch your volume levels, but at least you can see the amazingness that is Coachella. Enjoy!